I’m sorry, but what part of the last several days of dropping down to the 50s in the day and freezing at night can possibly constitute “early spring”? Oh, and did I mention the rain? Riding was the fun part. Clean-up afterwards, not so much. Still, it was a great excuse to finally do some mud-slinging with my boots. Contrary to popular belief, not every inch of space around here is covered in sand. And as much as I sometimes grumble about pulling out every marginally-water-resistant article of clothing I own to function through the winter rainy season…it is good for the water table, especially when the mountains get their fair share of fluffy white stuff. Then the first weekend in March, I’m heading down to the Sonoita ride…to ride! 50-miler on day one on a friend’s horse (who I met and rode last weekend…12 miles later, the horse and I still liked each other, so the ride was declared a ‘go’), then the possibility of the LD on either day two or three on another friend’s horse (who I will meet this weekend). And I’m currently completely surrounded by bits-n-bobbles of various ride stuffs. A sampler pack of various GU products (energy gels, energy chomps, e’lyte drinks) sits on my overflow desk. Two boxes of boots are sitting in the middle of my bedroom. 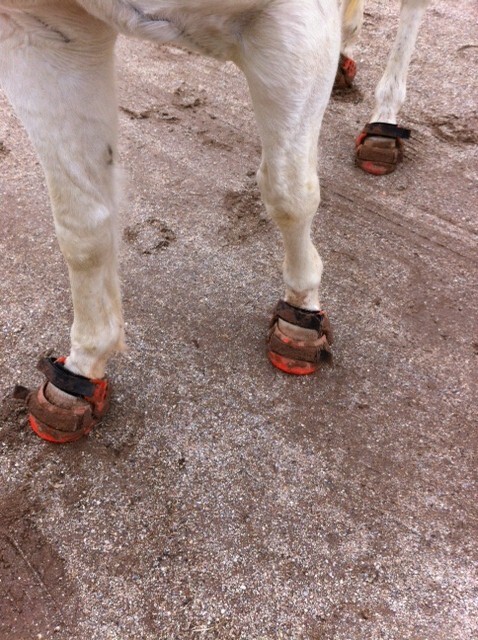 One pair of boots is in the process of having cables adjusted and straps changed out. I’m currently experimenting with tying my own tailing line…see photo below. Purple is existing, lightweight yacht rope. 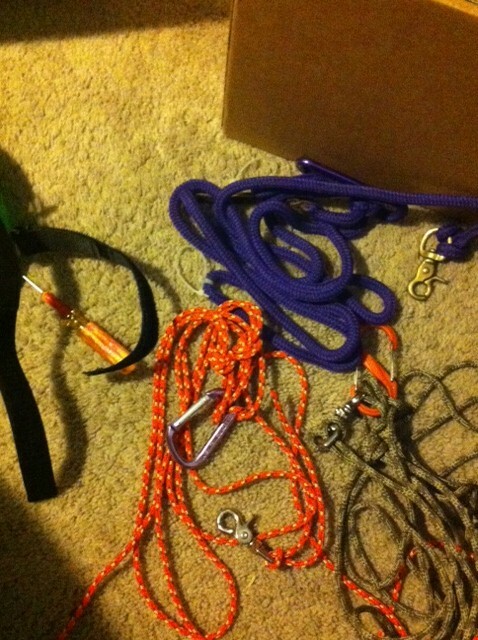 Orange is 4mm climbing rope. Tan is 5mm climbing rope. Will experiment with the tailing lines and report my findings later. Making things slightly more interesting is the fact I’m flying out for 20 Mule Team, so am limited by what I can cram into a suitcase, versus filling all available space of a suburban. Ah, well. I’m not riding, so that’s easier…and I do love a challenge.